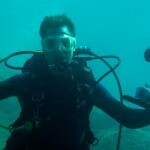 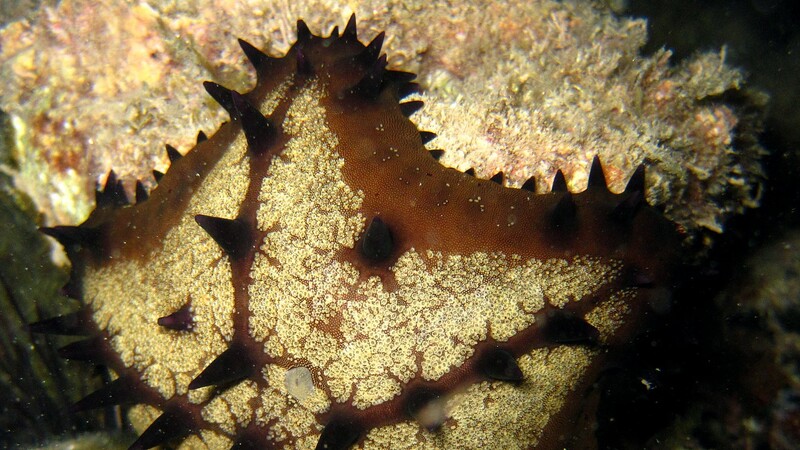 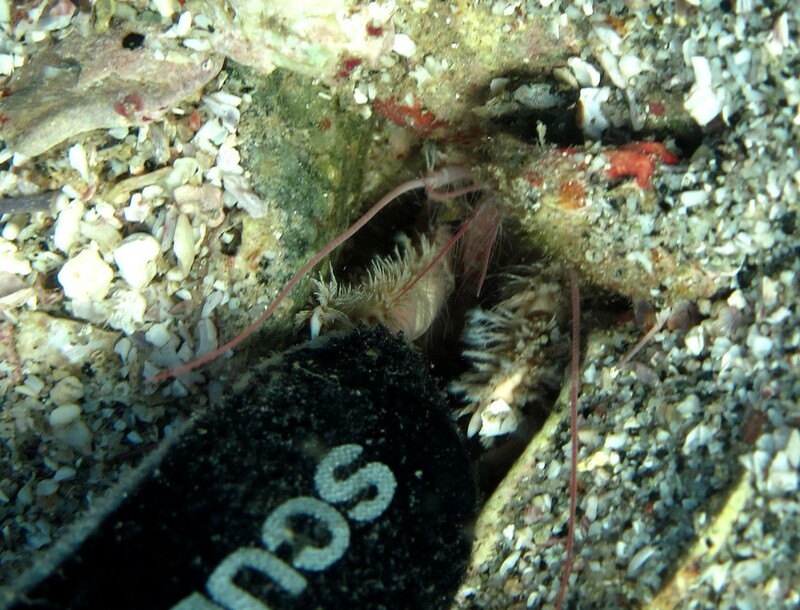 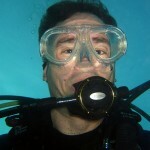 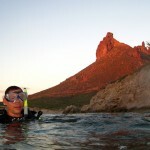 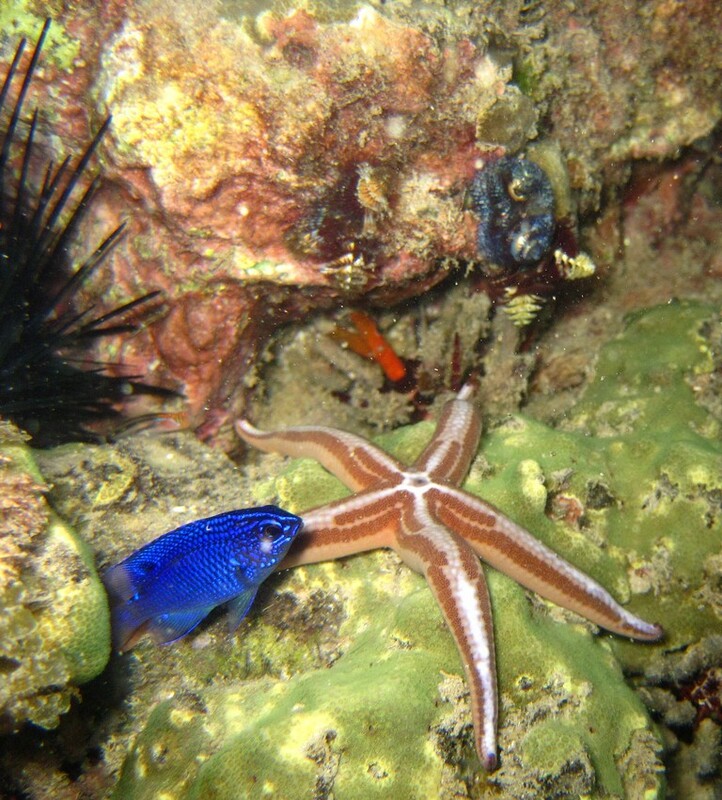 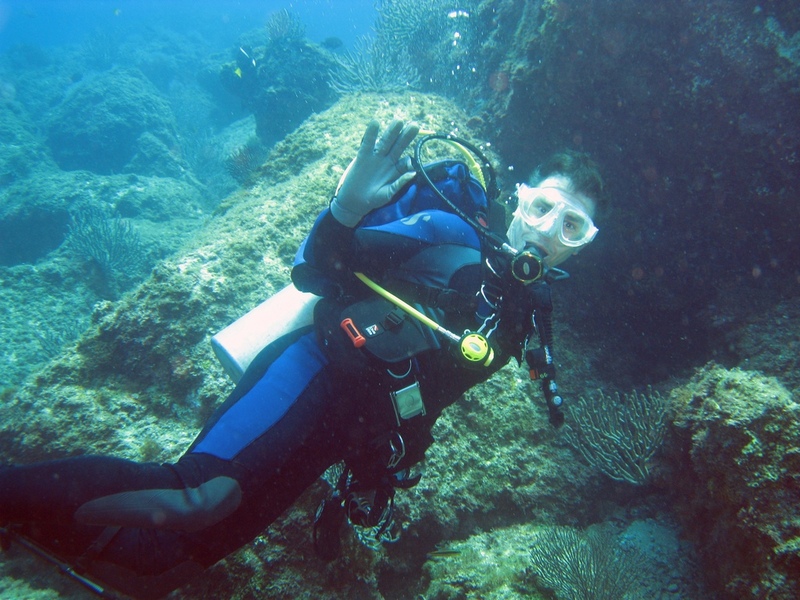 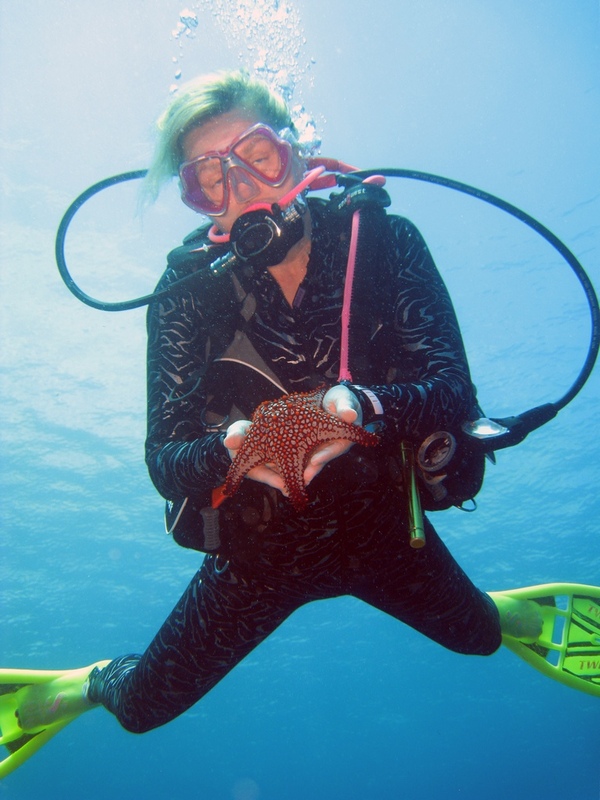 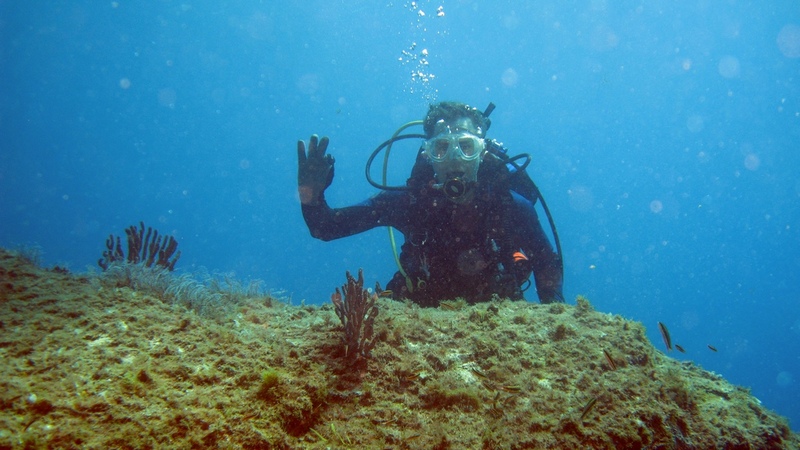 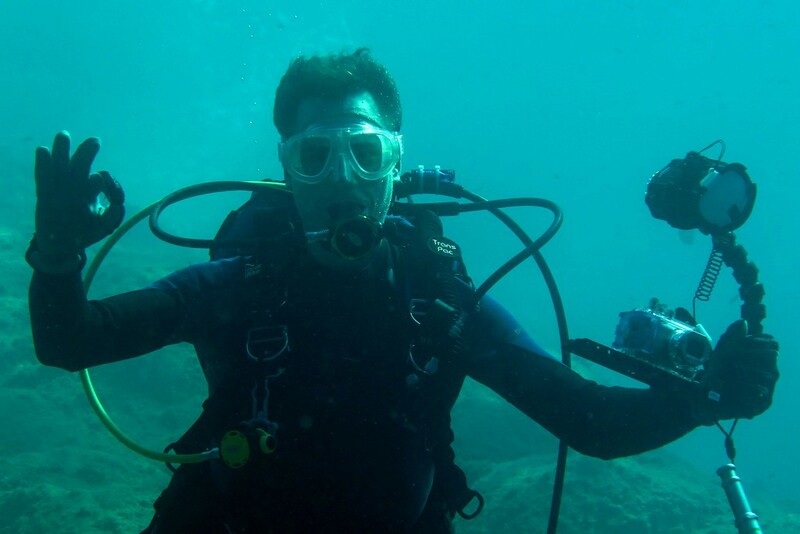 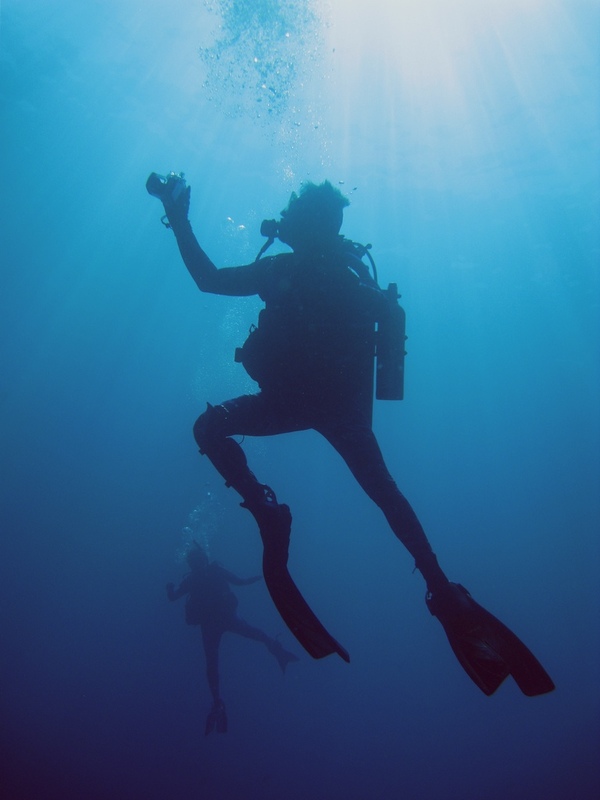 I just returned from a short diving trip to San Carlos, Mexico. 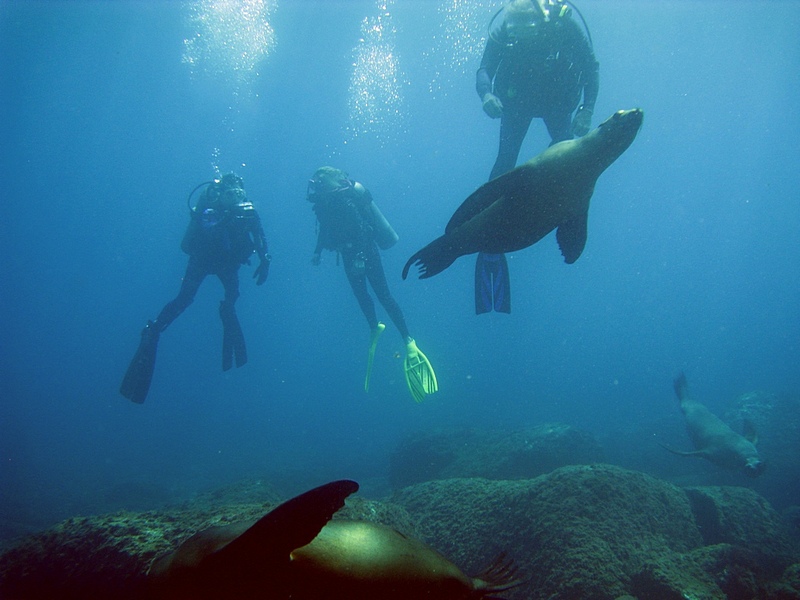 It’s in the sea of Cortez, about 175 miles south of the border and accessible by car from Arizona, so we drove from Flagstaff – a trip of about 10 or 11 hours. 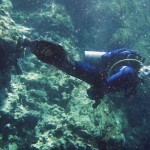 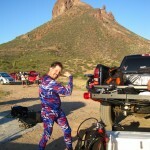 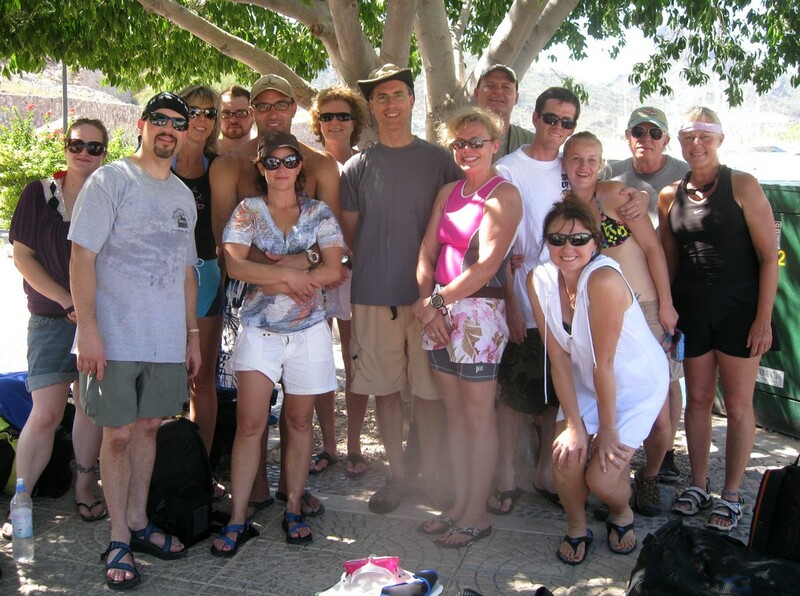 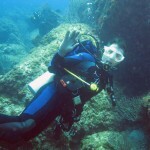 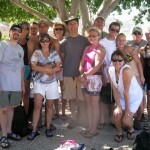 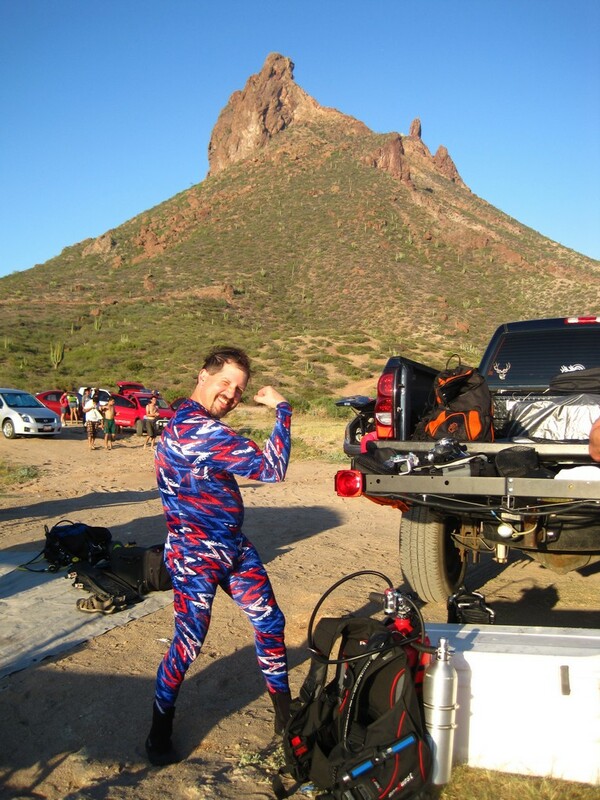 The trip was arranged by Summit Divers of Flagstaff and was very reasonable. 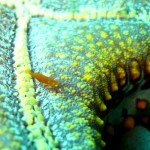 Click on any of the images in this post to see them larger. 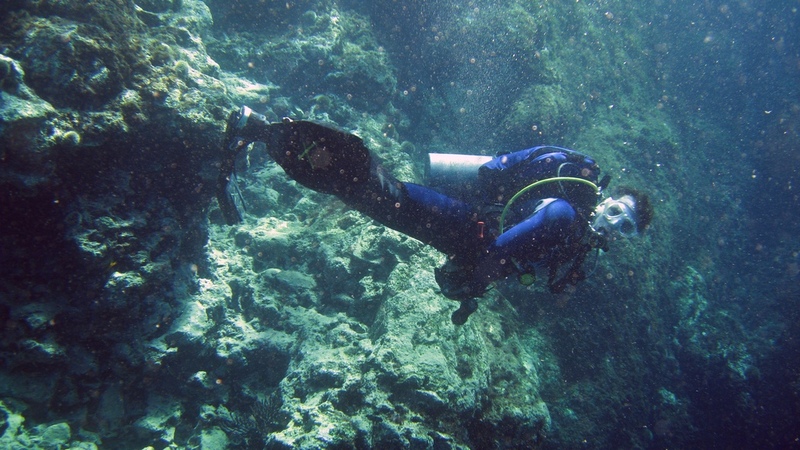 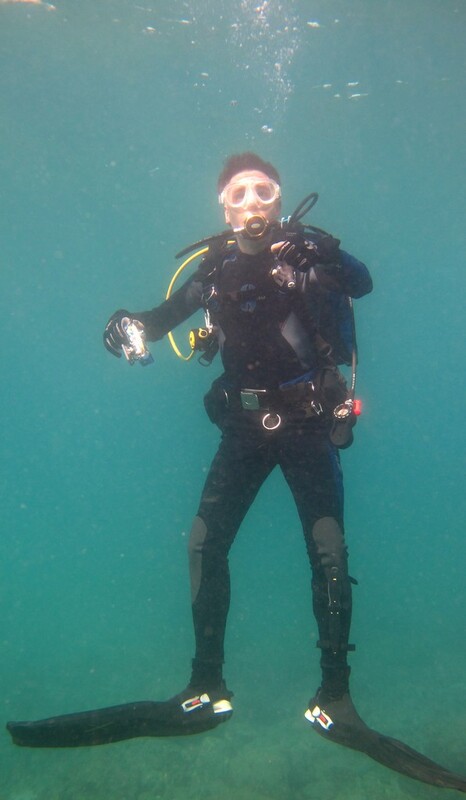 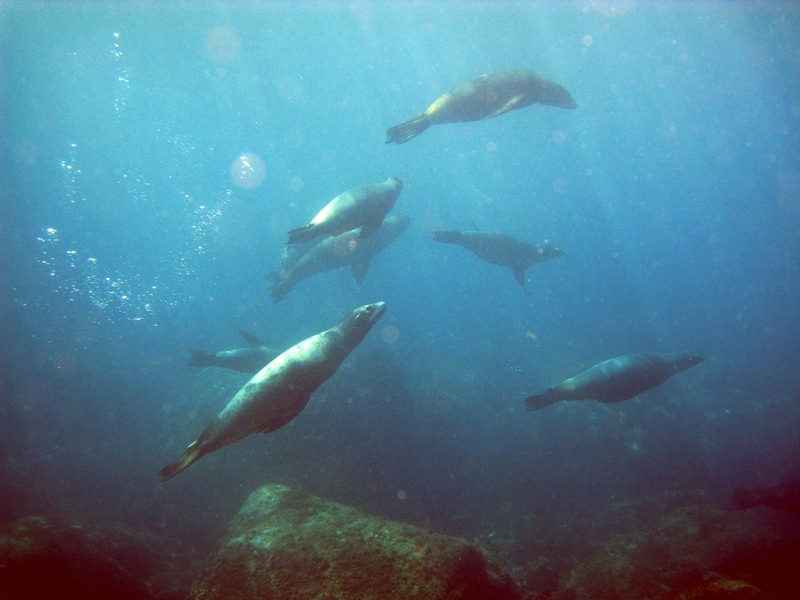 Near the shore, the water was full of particulates, so I’d call the visibility just OK. however, when we dived at “seal island” the visibility was great – 100 feet plus! 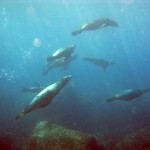 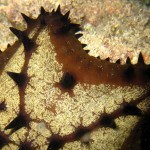 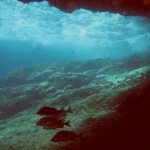 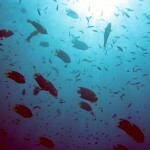 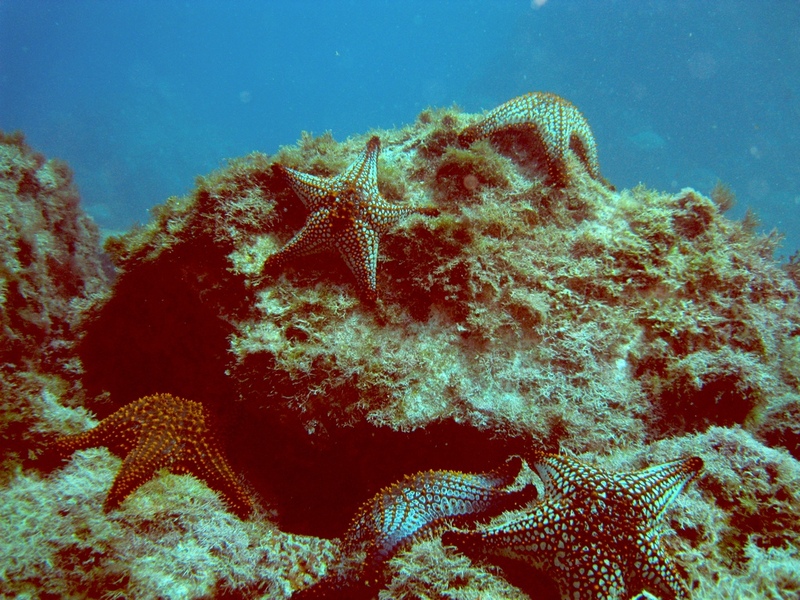 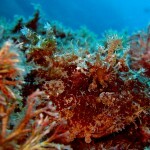 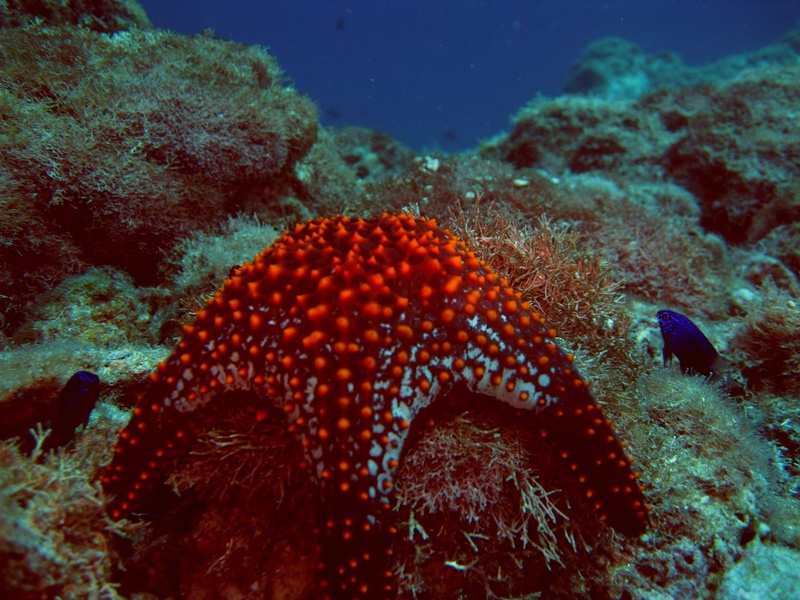 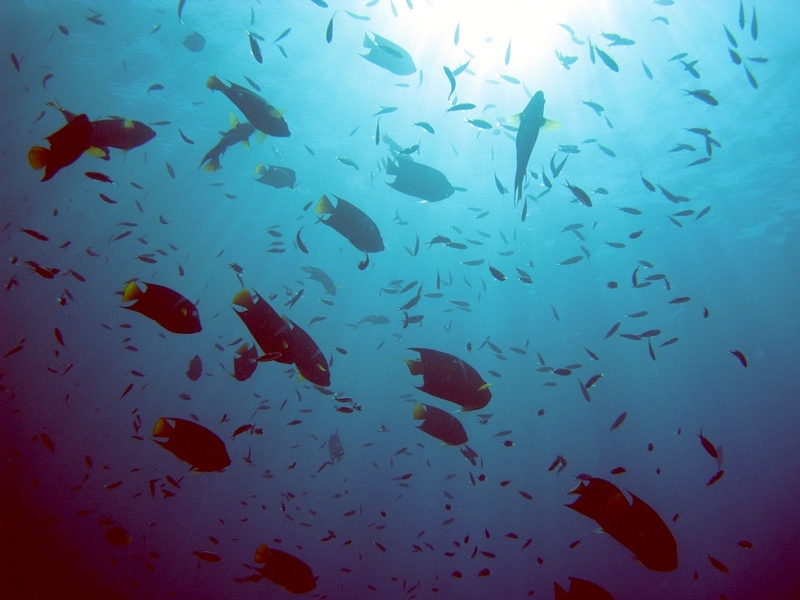 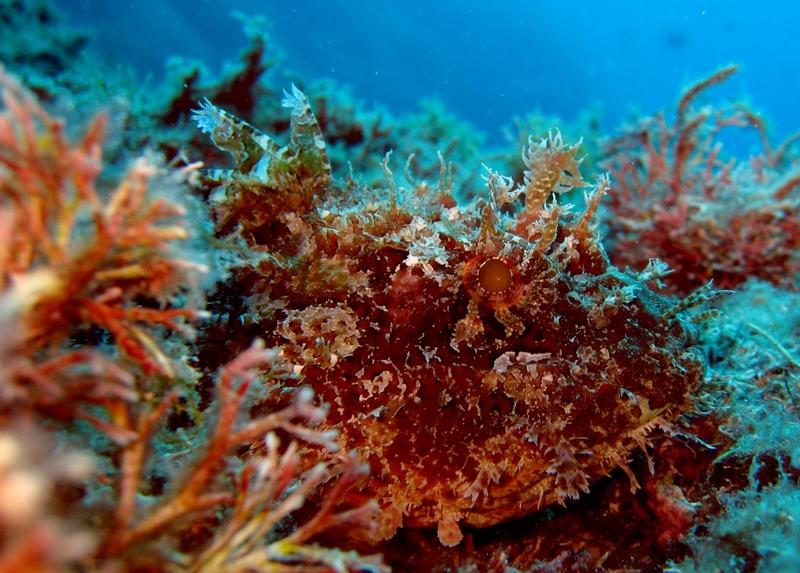 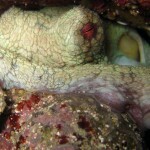 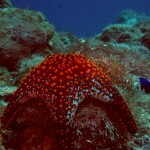 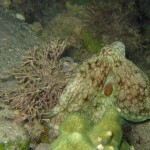 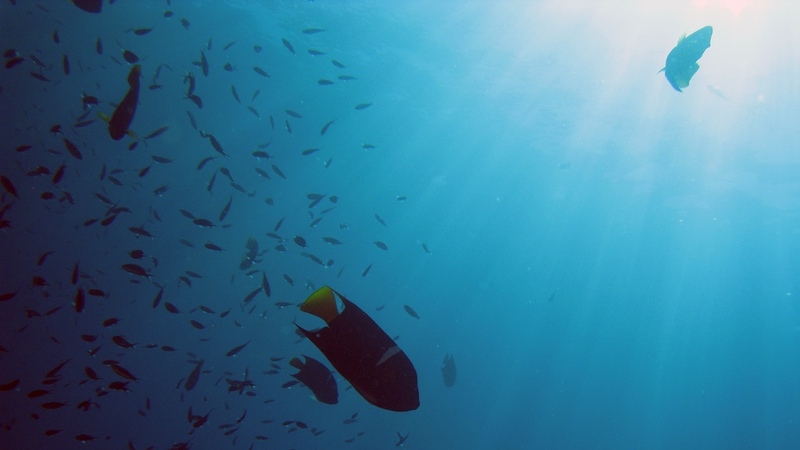 Seal island is the place to dive, and the conditions there are far superior to the shore locations. 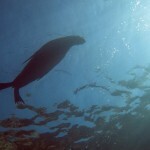 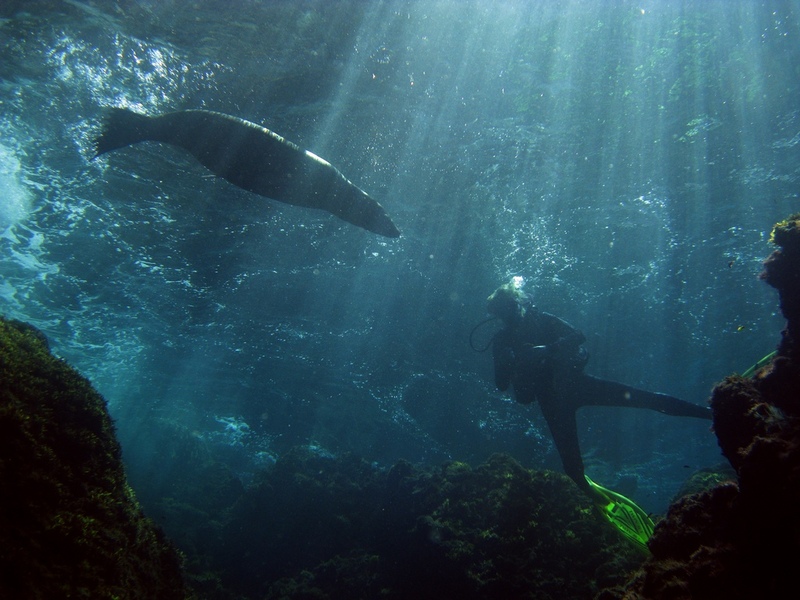 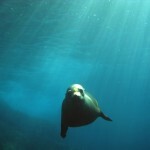 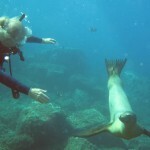 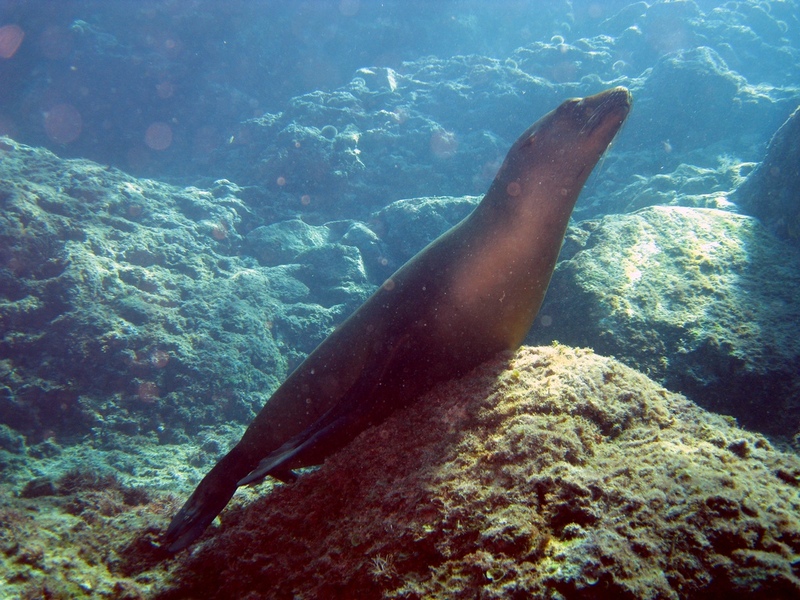 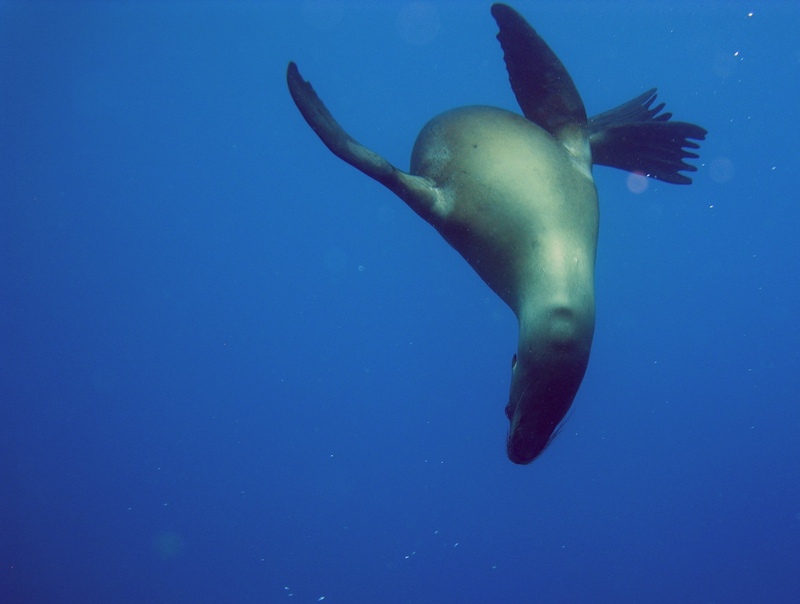 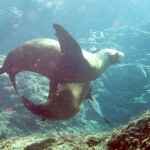 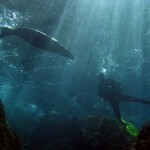 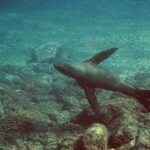 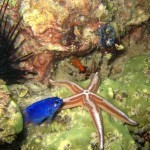 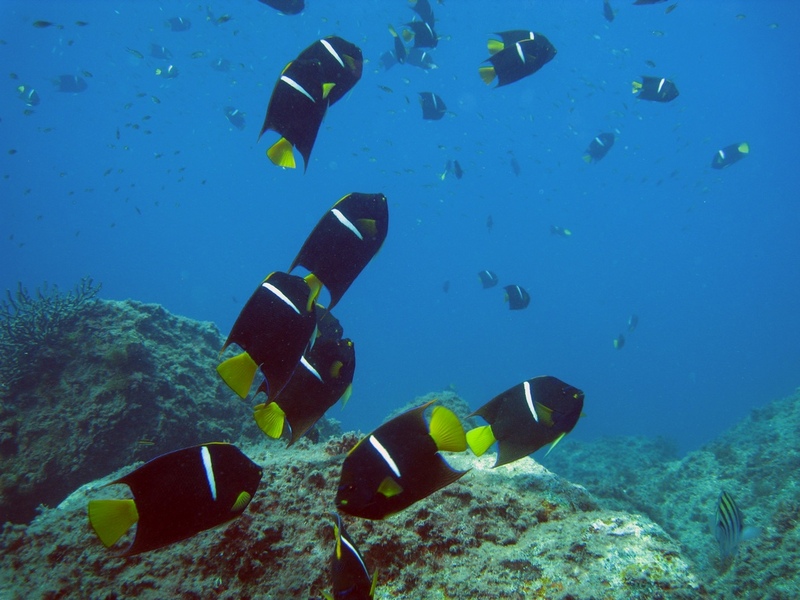 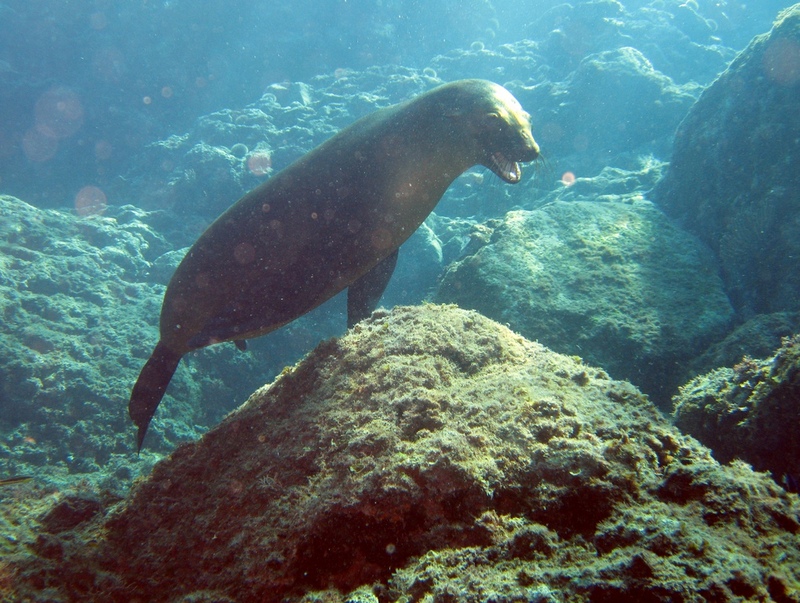 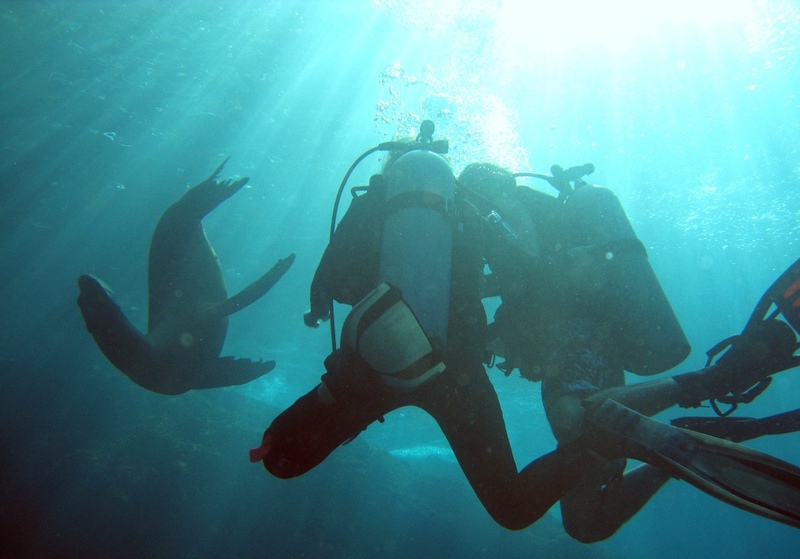 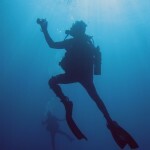 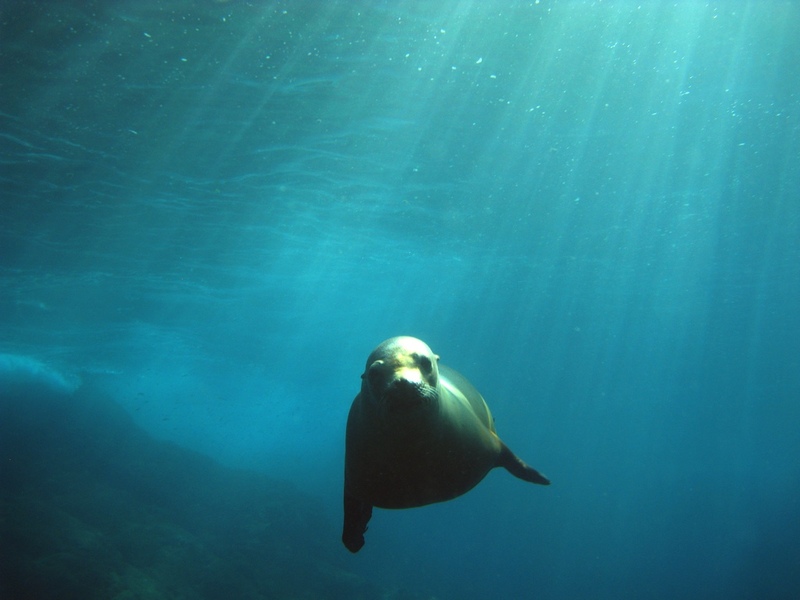 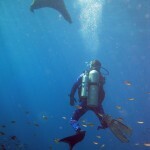 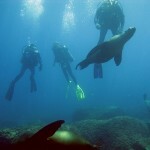 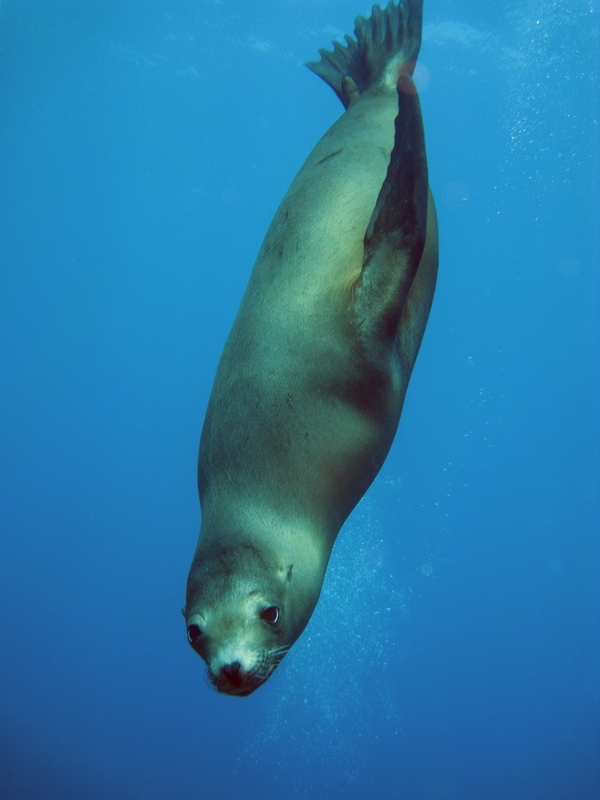 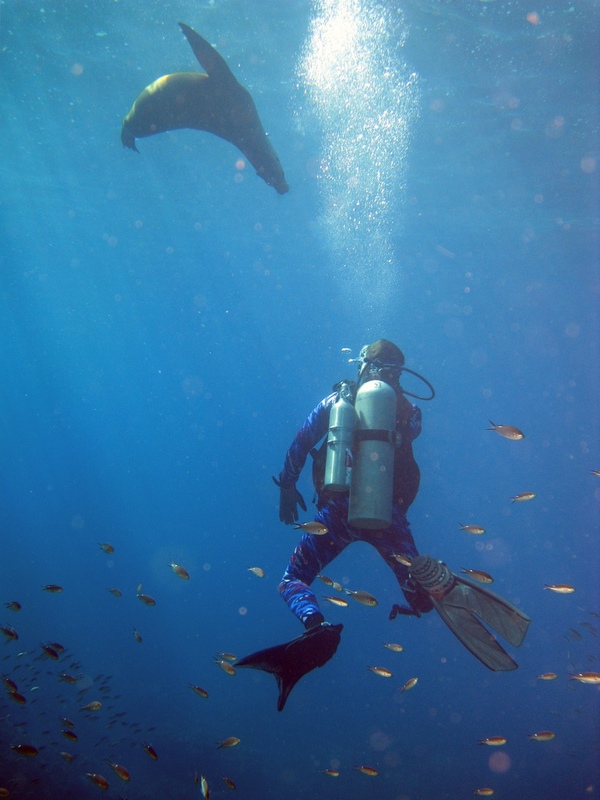 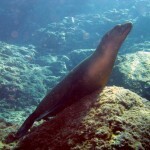 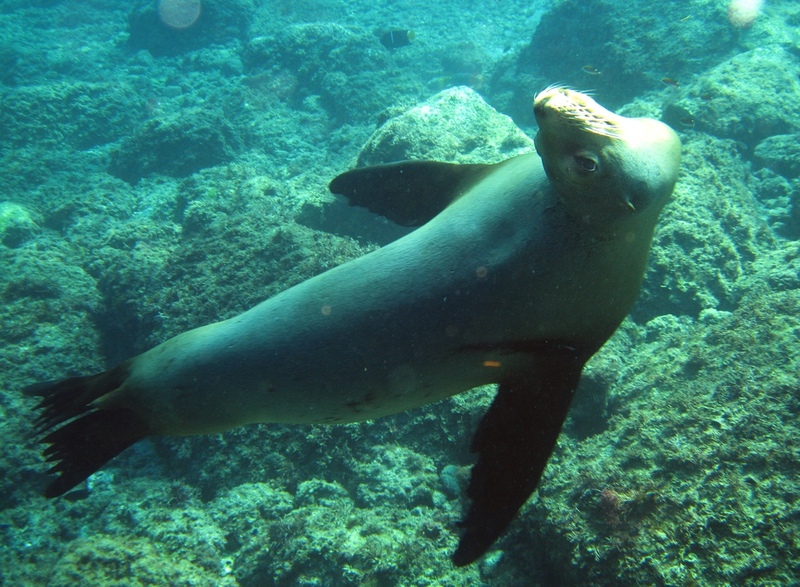 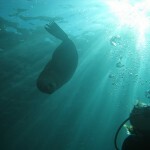 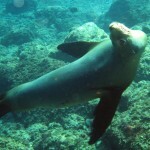 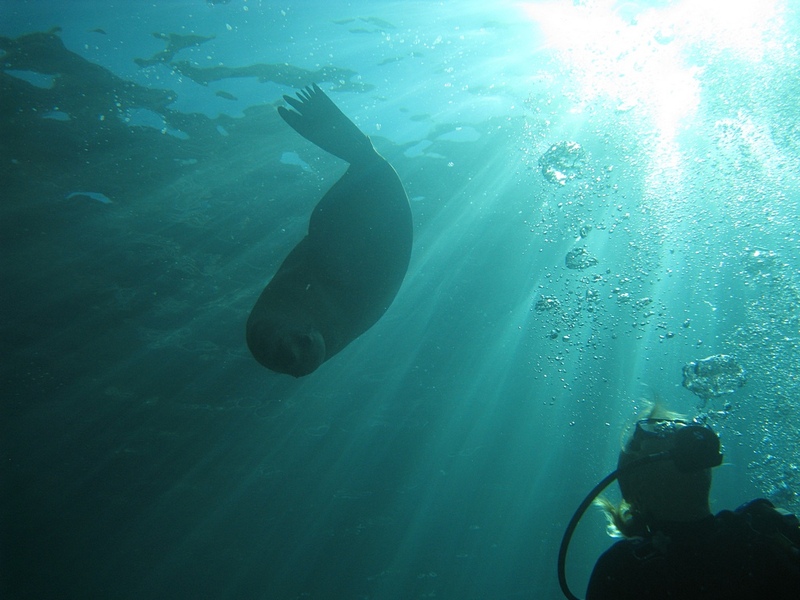 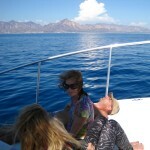 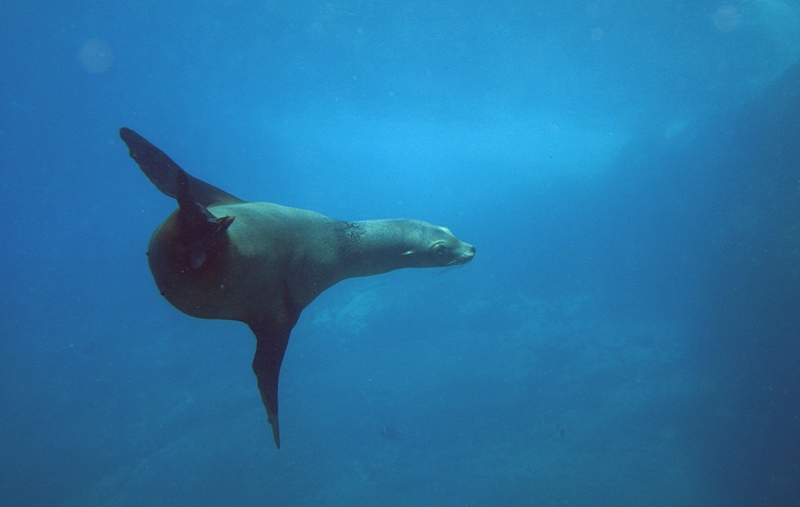 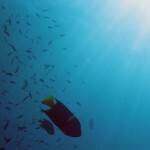 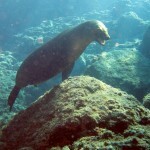 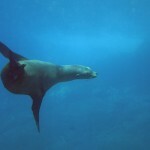 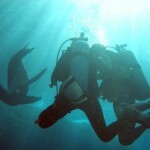 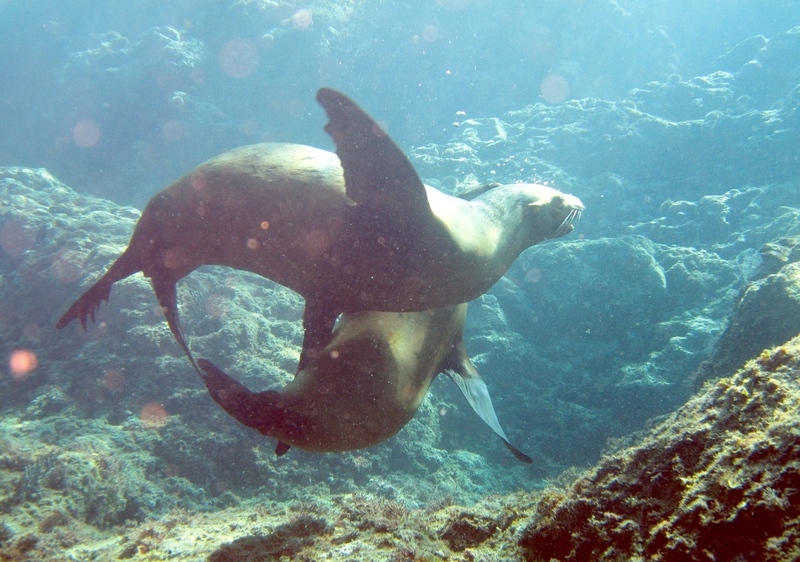 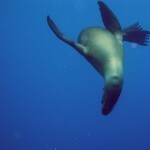 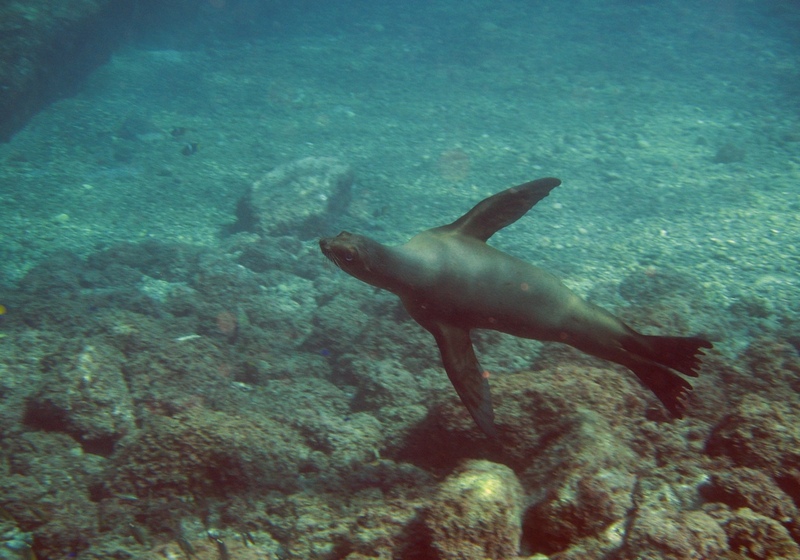 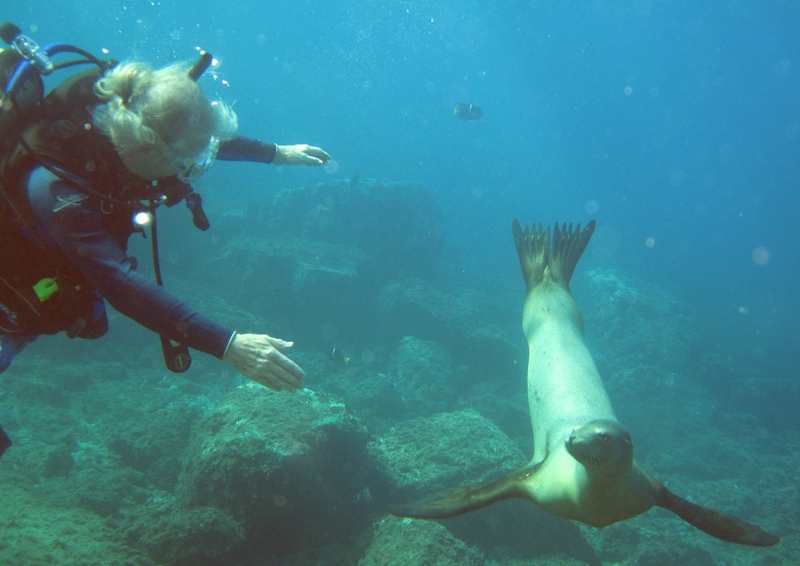 Plus, the sea lions will come and check out divers, which is the highlight of this dive. 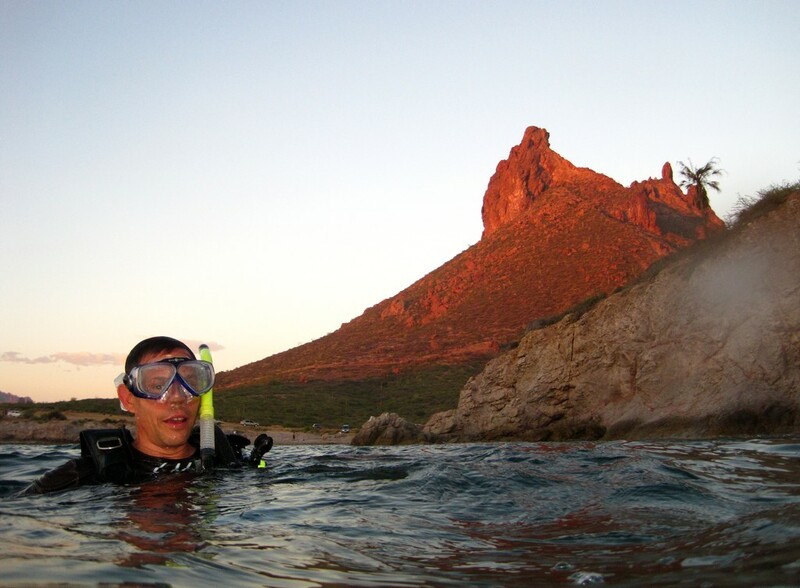 We started out with some shore diving at sunset; Dive shop owner Chuck and his wife, Sherry, BBQ’d dinner for us while we dove. 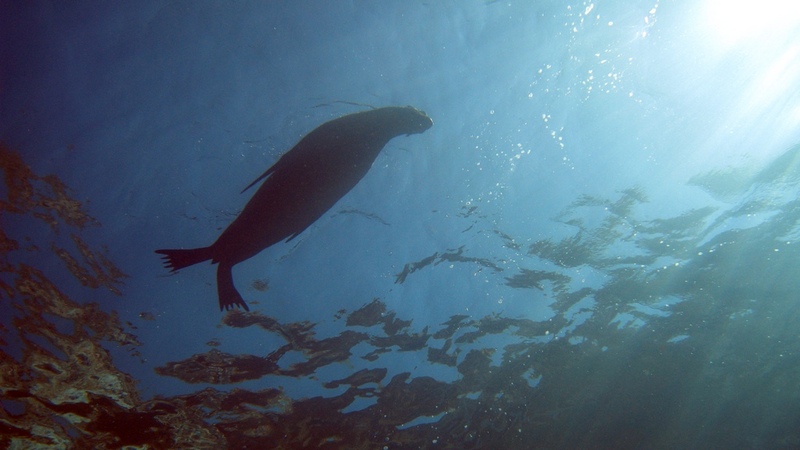 What could be better than surfacing to the smell of food cooking? 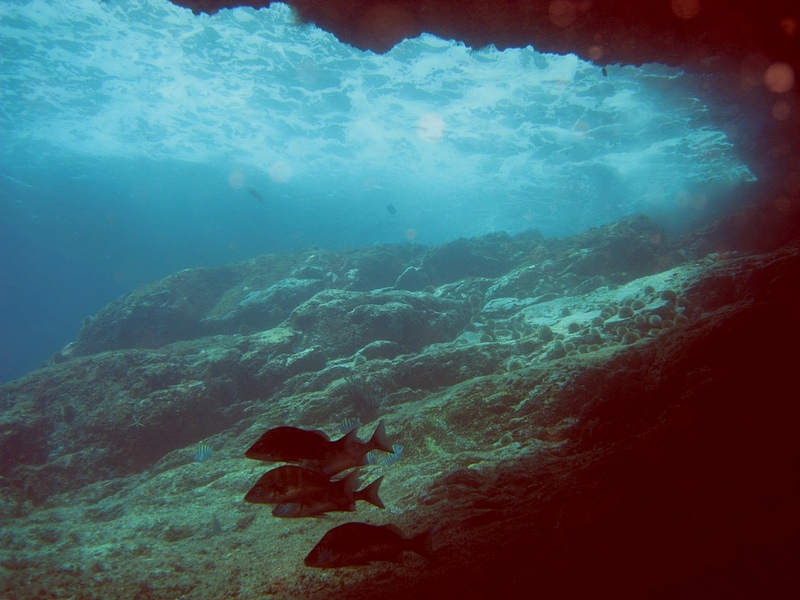 The landscape looks like something out of a road runner cartoon, and it’s very dramatic how the beautiful sea meets the parched desert. 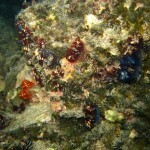 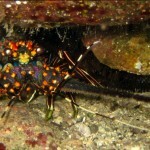 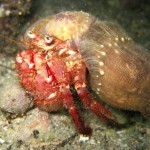 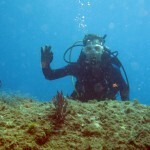 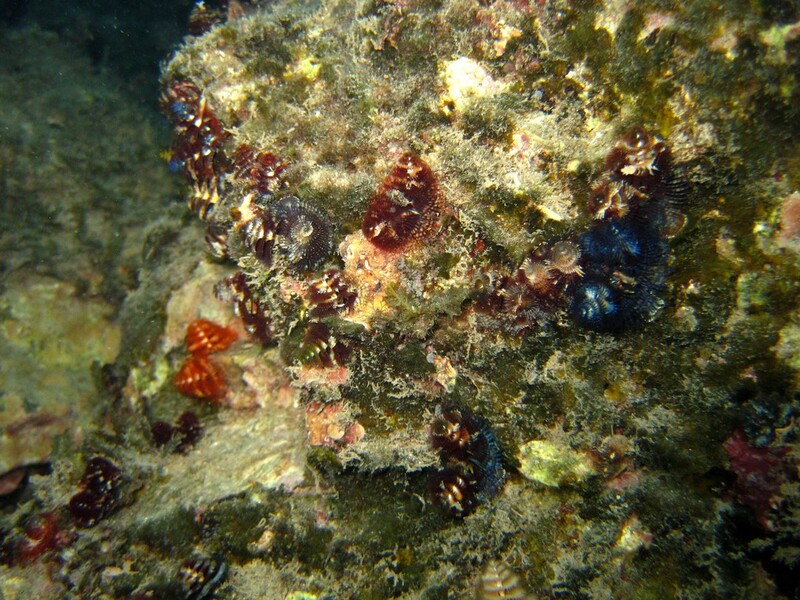 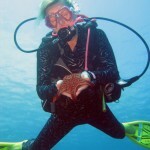 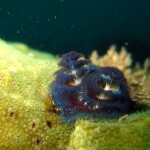 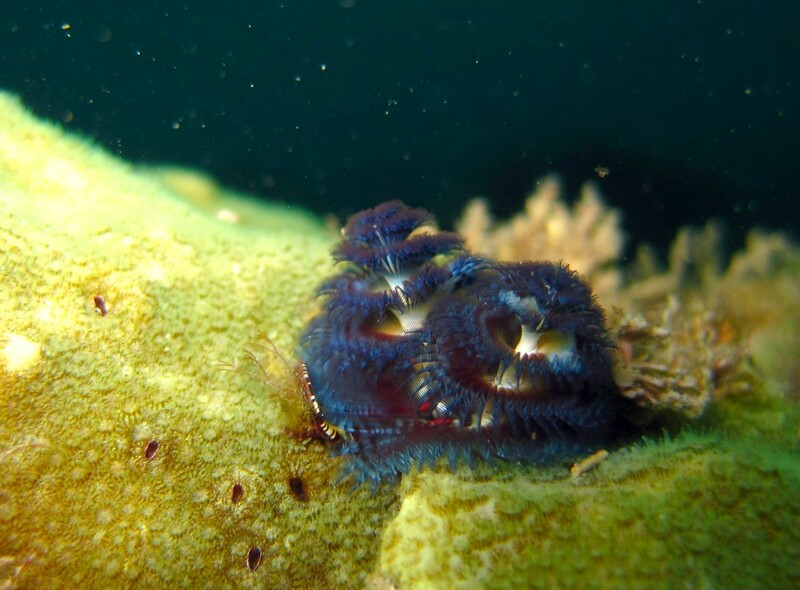 Here is my dive partner that day, Mark R.
I’ve never seen so many Christmas tree worms, and of so many colors! 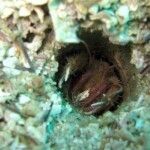 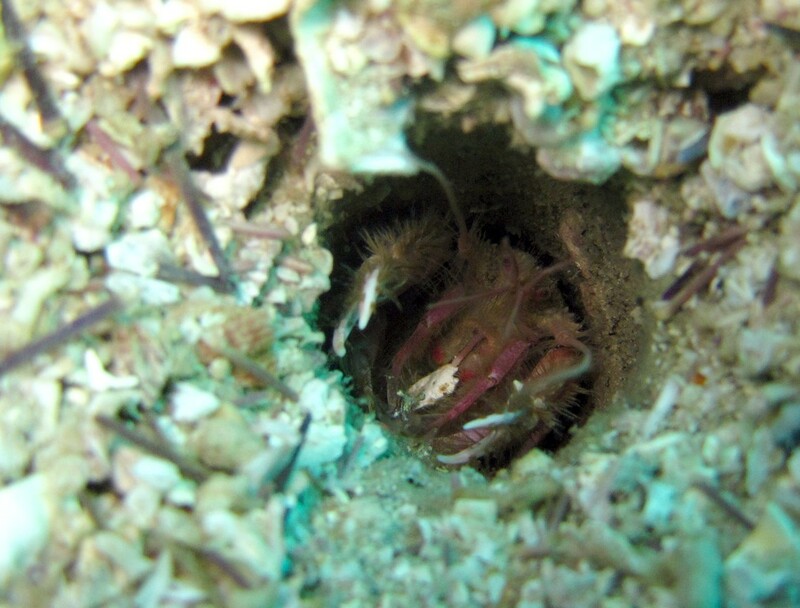 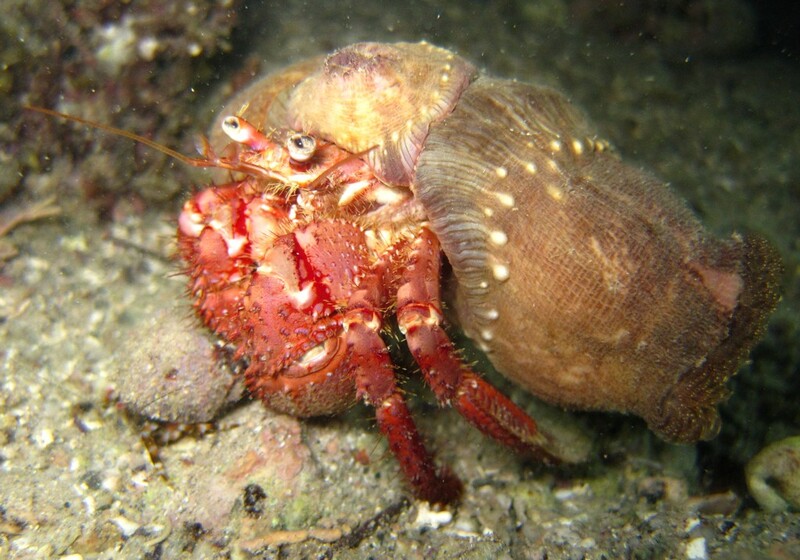 There are little shrimplike creatures that bore perfect holes in the sand and lurk inside. 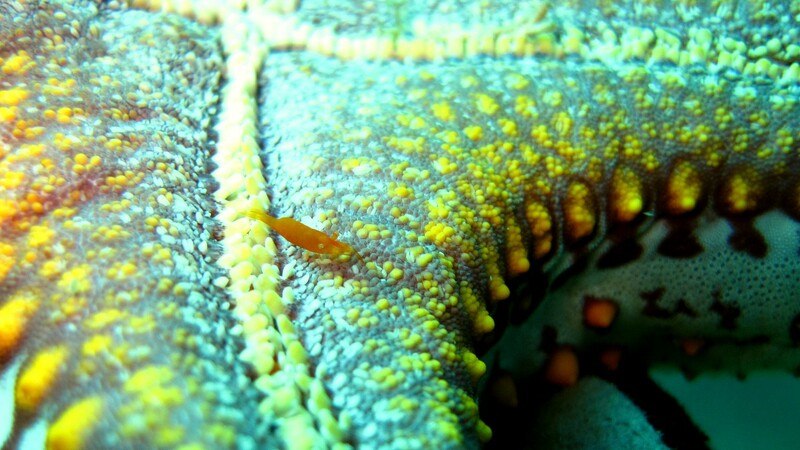 I provoked one with my finger – you can see how small these guys are – and it pinched me, much harder than I expected. 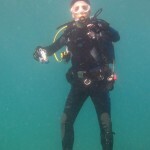 I wouldn’t have done it with bare hands! 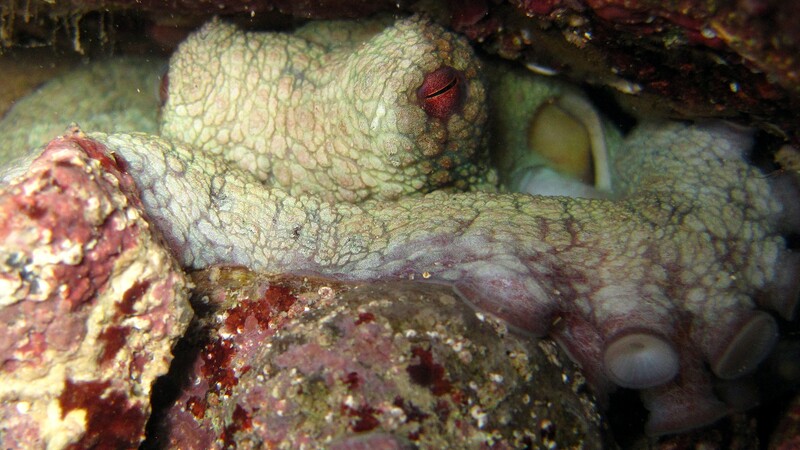 The next image was taken by Jeff A. 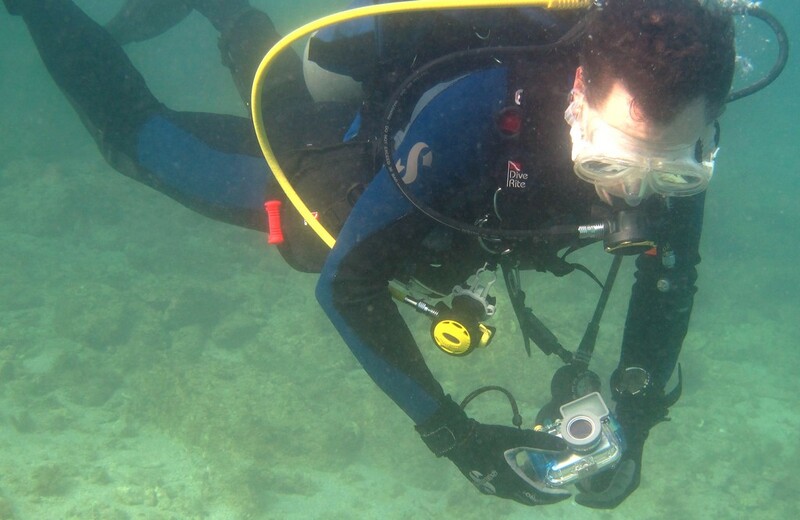 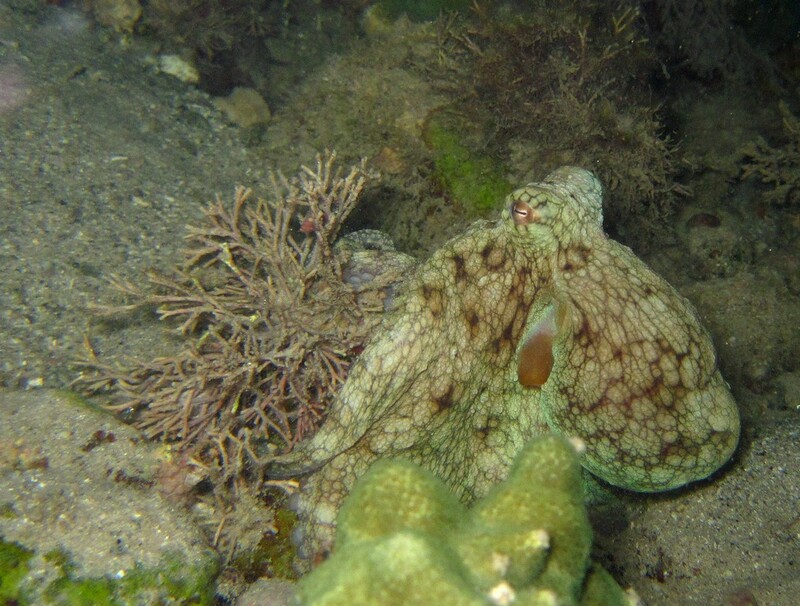 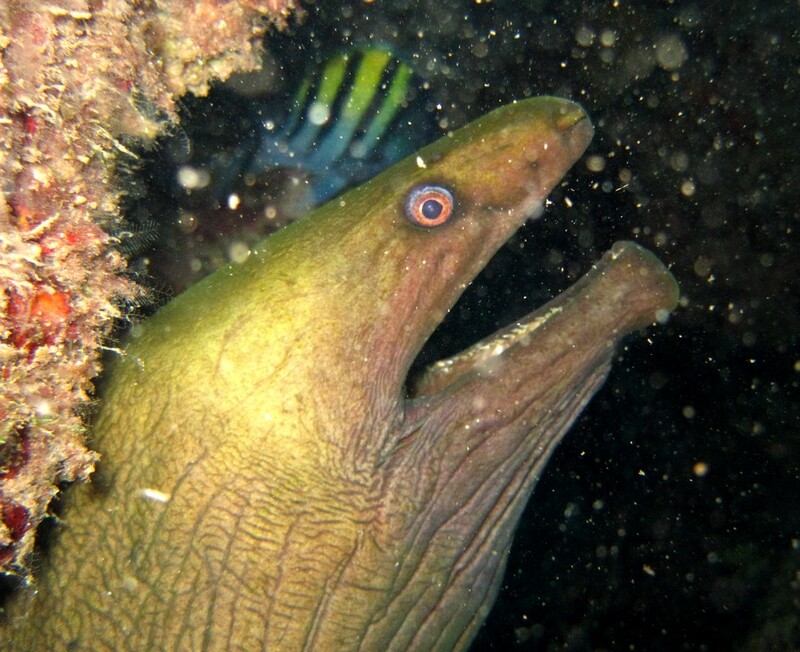 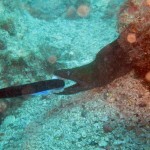 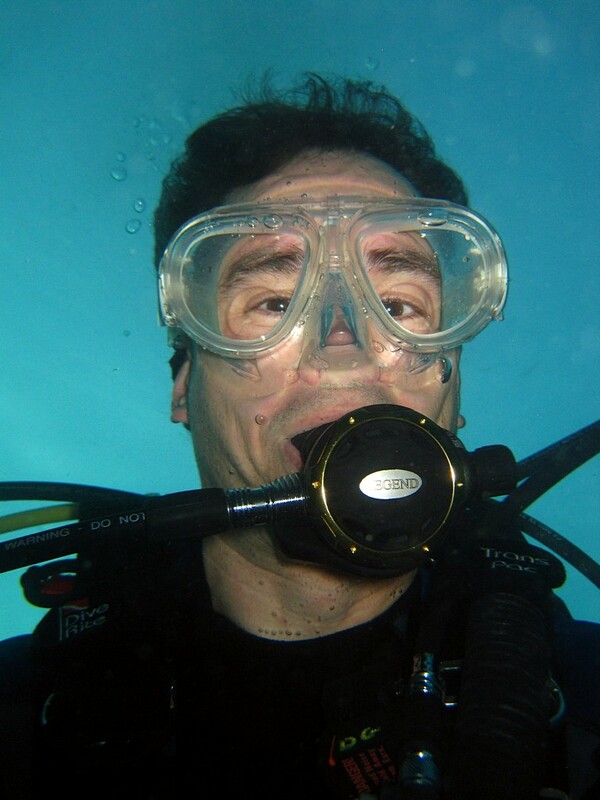 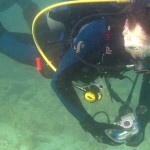 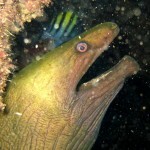 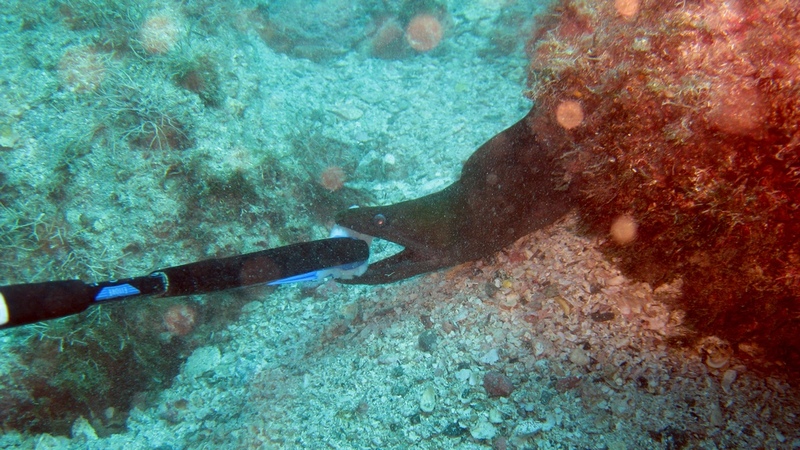 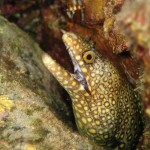 Speaking of moray eels, one of our group – Dr. Jeff – invented a way to feed them safely using a grabber. 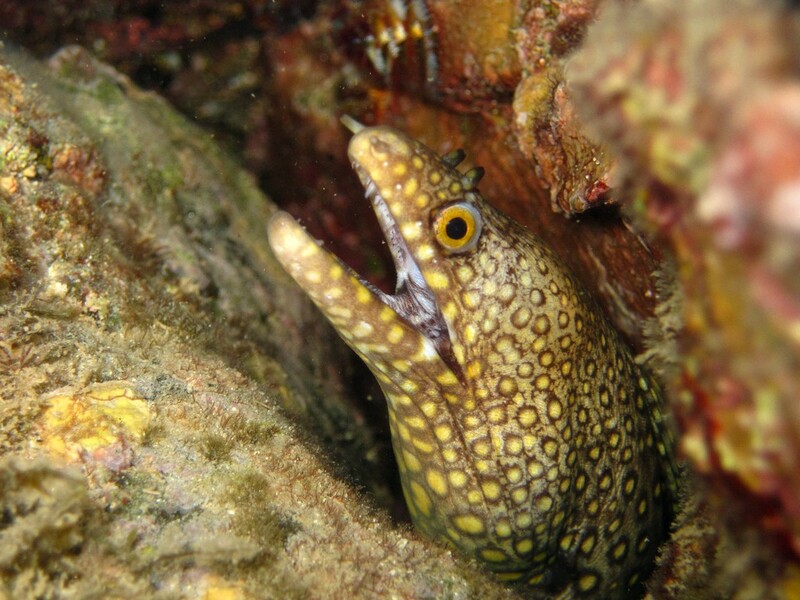 On every dive, we hunted for morays of appropriate size – we needed large ones – and then made their day by stuffing them full of food. 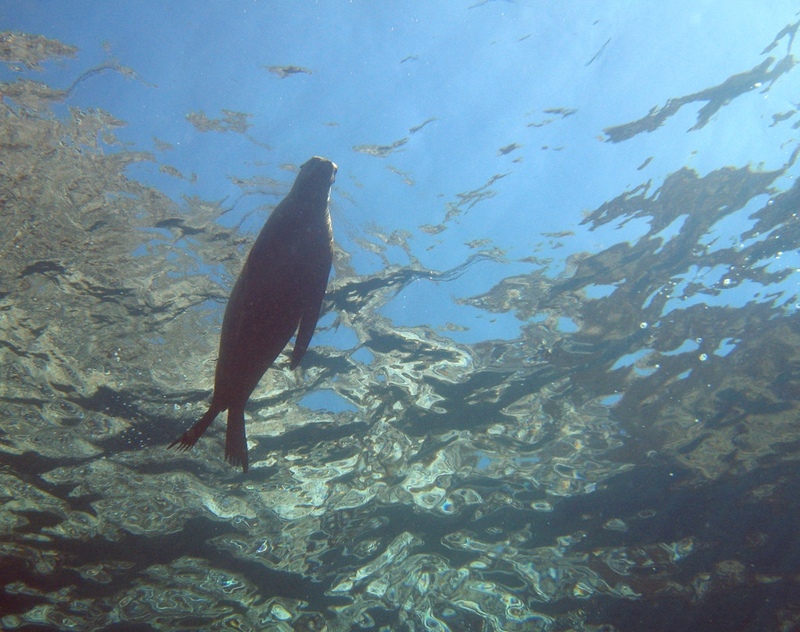 The sea lions interacted with us, nipping at our fins, barking underwater, staring into our faces from a foot away, and generally demonstrating their amazing flexibility and swimming prowess. 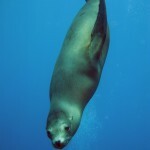 There were dozens of them and they would often sneak up on us from behind. 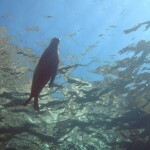 I’d look around, not see a single sea lion, and then turn around to find one staring at me at arm’s length or less! 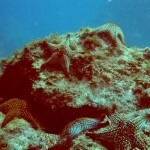 They are quick and difficult to photograph. 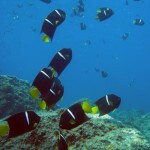 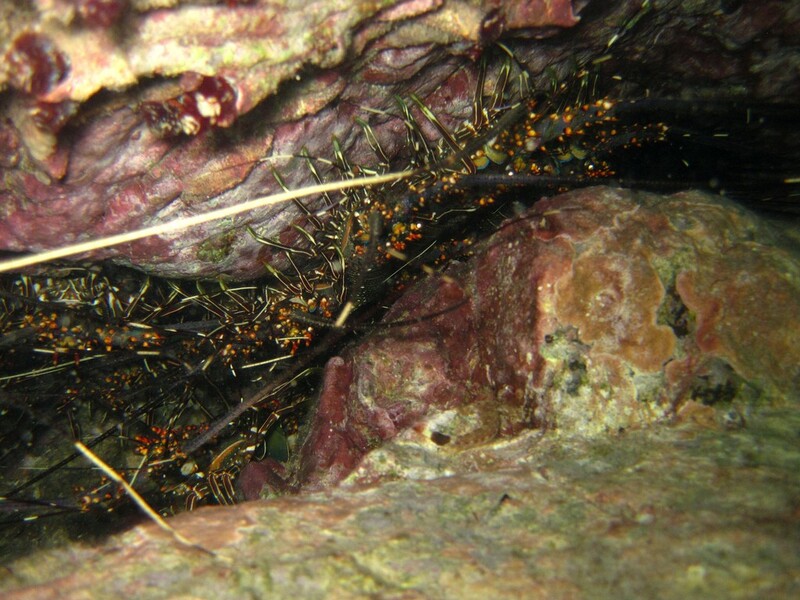 Great schools of fish hung over the bottom rocks. 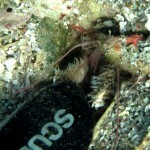 The next image was taken by Aline S.
Here are a lot more pictures – click on each one to see it larger. 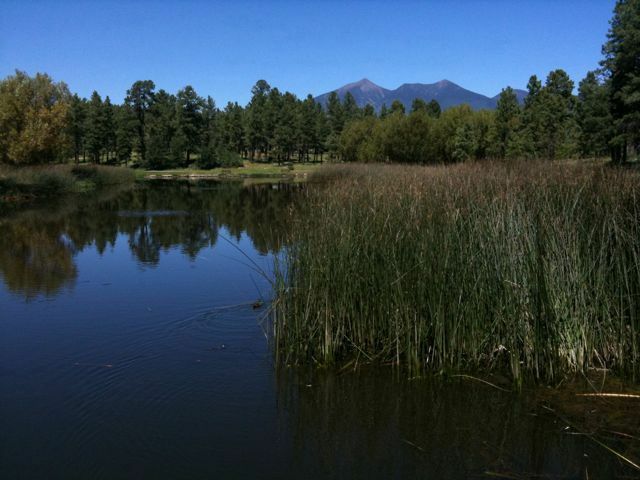 Buffalo park in Flagstaff has the most incredible views of the peaks. 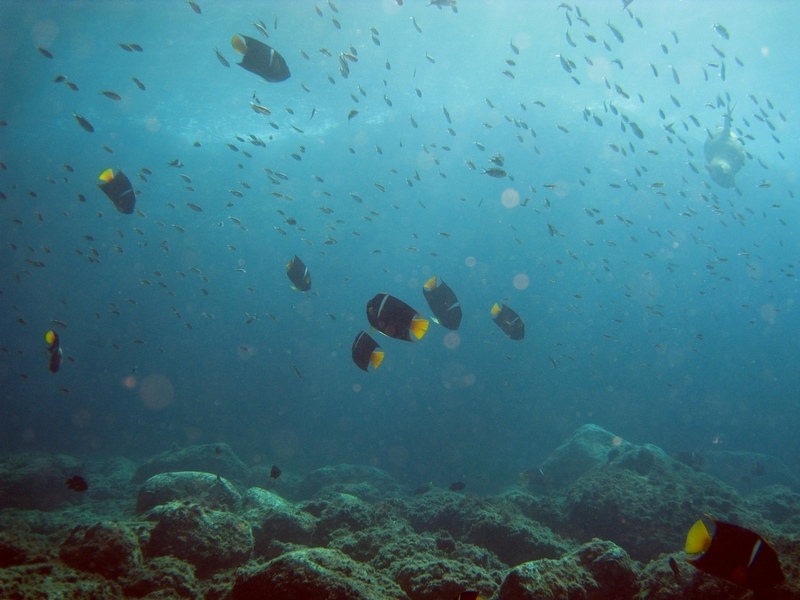 This evening at sunset, the size of the peaks was sharply contrasted with a complete absence of sound, as there was not a breath of wind. 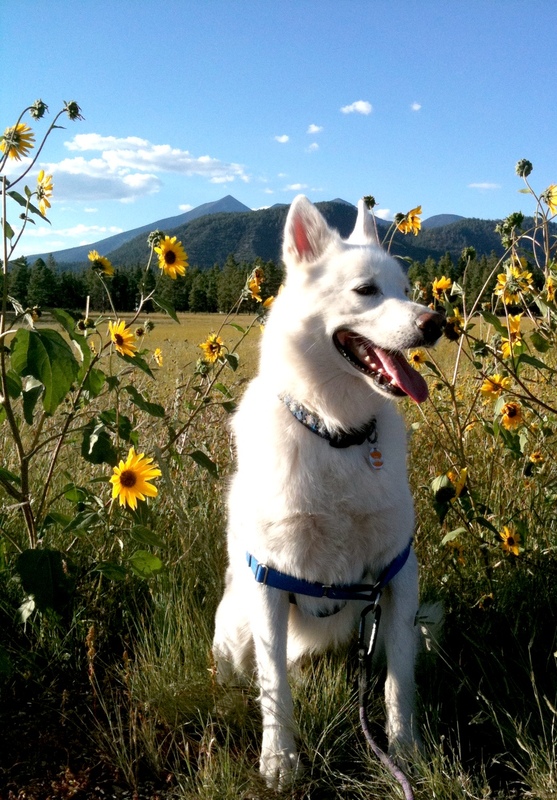 The area is alive with late-season flowers. 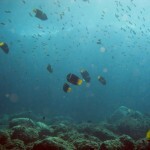 This is the view from a park located near my place in Flag.